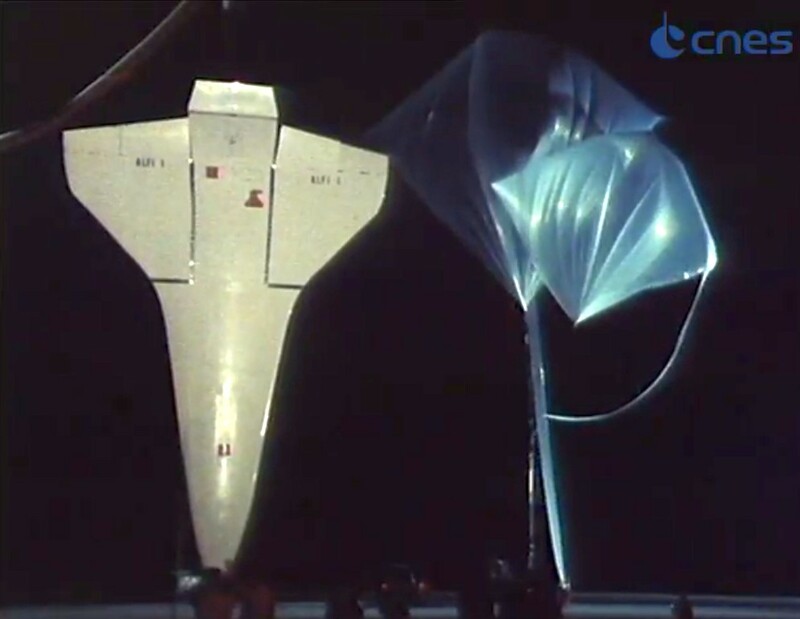 The FALKE program was created to perform aerodynamics tests in real flight conditions (subsonic and hypersonic) using a model of the US Shuttle dropped from a stratospheric balloon. 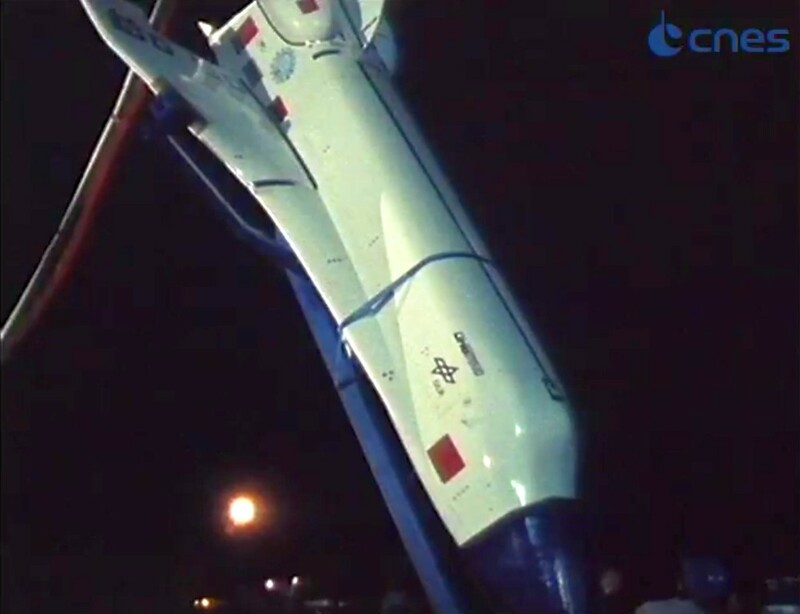 The project was part of the pre-developmental work for HERMES, a proposed spaceplane designed by the French Centre National d'Études Spatiales (CNES) in 1975, and later continued by the European Space Agency. The FALKE model was 6.8 meters long, 4.4 meters wide and 2.6 meters high, weighted 730 kg and was an exact replica of the Space Shuttle developed by NASA but scaled down 5,24 times. 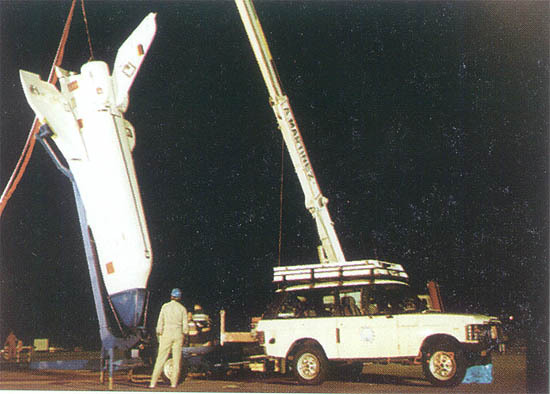 Althought HERMES was planned to be of a different design than the american Shuttle, FALKE's shape was based on it as the US orbiter was a vehicle of known flight, mechanic and aerodynamic characteristics, thus providing excellent benchmark tests, and well documents parameters to compare with. To obtain the desired data, a new complementary flight test technique was needed to be developed: after the model would be carried to an altitude about 40 kilometers, it would be dropped and accelerated in vertical free fall up to a flight Mach number far beyond Mach 1. In order to take full advantage of the potential energy, a steep dive with small angles of attack would be followed. This would be achieved by an on-board flight control system which computed the control surface deflections. The project had OHB-System GmbH as main contractor in charge of the definition of the flight vehicle, data acquisition, electro-hydraulics, integration and test, ground support equipment and system safety. 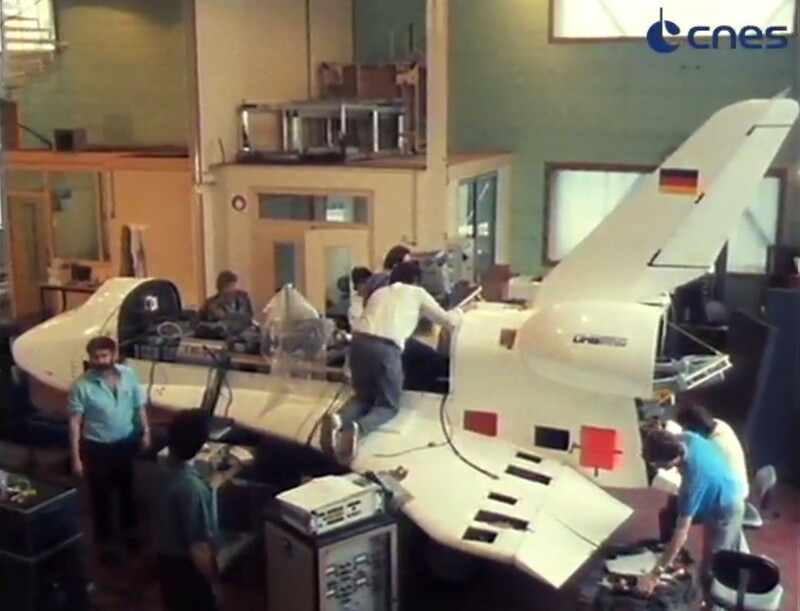 There were also other firms involved with specific parts of the project: Hofitan-Flugzeugbau constructed the test vehicle; Autoflug GmbH developed the recovery system; DLR was involved in parameter identification, wind tunnel tests, data analysis and hardware-in-the-loop simulation; ISRA was in charge of the software for the flight controller; MBB ERNO provided the on-board computer and ZARM performed the post-flight analysis of aerodynamic data. 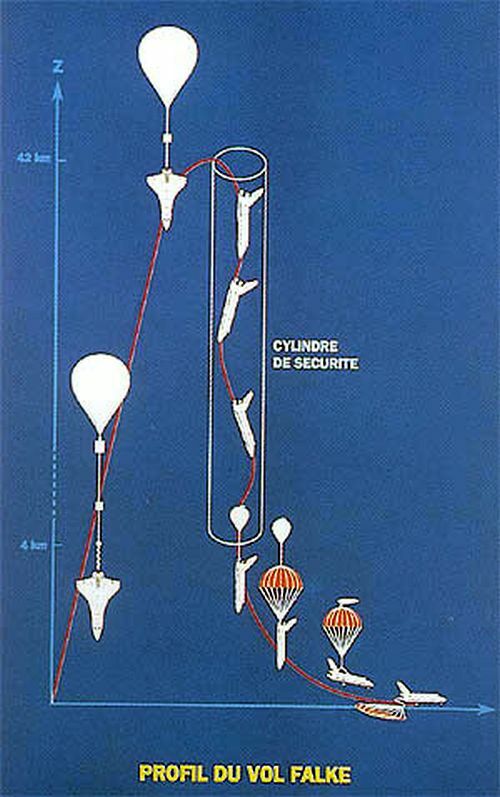 The final part of this chain was the balloon division of CNES in charge of the provision of the balloon and the managing of the drop test operation. The FALKE model was controled via movable steering surfaces that used an electro-hydraulic system. A Rosemount air data sensor was mounted for measuring the angle of attack and angle of sideslip and complemented by pitot tubes and static pressure and temperature sensors. A Litef LTR-81 attitude and heading reference system (AHRS) measured the angular position, rate of turn, acceleration, and several other parameters. The vehicle was controlled by an onboard flight-control computer which counted with sequencer, controller and maneuver programs. An onboard data recorder served to store the information gathered during the drop and a telemetry system allowed to send commands to the vehicle from the ground control. All these systems were fed by a battery assembly also located inside the vehicle. Althought plans were for at least three drop tests of FALKE, this was the only mission carried out. Shortly after the test, the HERMES project suffered numerous delays and funding issues and was finally canceled in 1992. 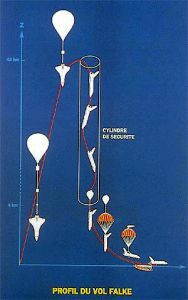 The mission also had the privilege of being the only test of a payload of this size in freefall performed over France. CNES acquired a great experience in this kind of missions that in the coming years would benefit other projects that also would perform freefall tests like Cassini-Huygens or HOPE-X. The balloon was launched using the auxiliary balloon method, early in the morning of September 6th, 1990. After an initial ascent phase enduring 2 hours and 43 minutes, the balloon and it's payload reached a float altitude of 38.8 km. Once there it floated during 48 minutes, and once the predicted landing area was reached the FALKE model was dropped. As planned, it completed the freefall inside the 9 km diameter safety corridor and at an altitude of 6 km, a parachute system was deployed. After tilting the vehicle into the horizontal position, it landed on airbags. Recently, in an interview to Mr. Robert Fabères, who was the first member of the CNES balloon launch crew at Aire Sur L'Adour, while he was remembering old anecdotes from it's years of activity he mentioned an unknown fact about the FALKE mission: "...A 1/2 scale model of the American space shuttle fell in parachute on the roof of a house in Vic-en-Bigorre..."